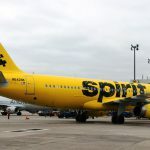 Bradley Airport’s newest carrier, Spirit Airlines, launched two new flights to Orlando, Florida and Myrtle Beach, South Carolina, and its nonstop to Ft. Lauderdale, FL will commence in June. The inaugural nonstop flights departed from Bradley International Airport on 4/27 to Orlando International Airport and on 4/28 to Myrtle Beach International Airport. 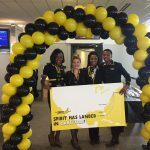 The inaugural flights were celebrated with the traditional water cannon salute, as well as a Spirit Airlines themed welcome reception for the passengers at the gate. Spirit Airlines is Bradley’s first ultra low-cost airline, delivering competitive airline fares to regional travelers. 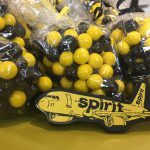 All of Spirit’s operations at Bradley Airport will utilize either a 145-seat Airbus A319 or a 182-seat Airbus A320 aircraft. The Orlando route is offered daily, year-round and the Myrtle Beach nonstop is a seasonal service offered four days a week. Spirit will also commence nonstop service to Fort Lauderdale on June 15. The ultra-low cost airline business model, which is increasing in popularity among economy travelers and the college student population, offers introductory service to a variety of destinations for competitive fares. These low fares allow travelers to pay a-la-carte for only the services they need (like baggage and seat selection), giving passengers great deals on flights.